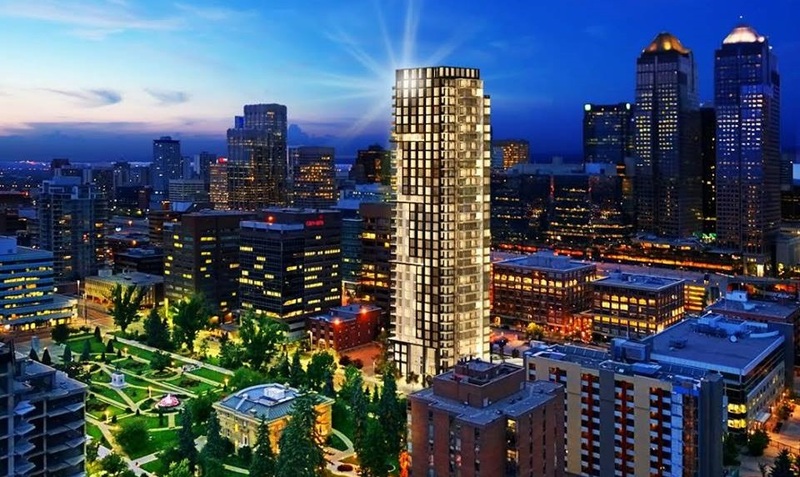 Reaching 34-storeys above ground, Park Point is Qualex-Landmark’s newest downtown Calgary residential condo development. Located on the former site of the CIBC Operations Centre building at 12th Avenue and 2nd Street SW, Park Point overlooks Calgary’s historic, two-hectare Central Memorial Park in the heart of the city’s vibrant, amenity-rich Beltline community. The neighbourhood — deemed a Walker’s Paradise by walkability expert Walk Score — puts residents within steps of every conceivable urban amenity, as well as one of Canada’s oldest and most stunning urban parks. Designed by global architectural firm IBI Group, Park Point will be comprised of two residential towers. The first tower will include approximately 287 condos, primarily one- and two-bedroom suites with optional den/flex spaces. Live-work townhomes will be located at street level. Available in three unique colour schemes, Park Point‘s functional condos will boast Italian-made Armony Cucine cabinetry, natural stone countertops, a fully integrated high-end kitchen appliance package with gas cooktop, expansive windows, stunning views and much more. The Calgary condo development will also be home to a host of resort-style amenities, including a yoga/pilates studio, steam room and sauna with change rooms, a private owner’s lounge with kitchen, 24 hour concierge service, secured parking, bike storage and maintenance area, and an outdoor terrace with a fire pit and barbecue area. The first release of Park Point condos is anticipated to occur in early 2015 out of its highly anticipated presentation centre, currently under construction at 301 11th Avenue SW, across from Central Memorial Park. While you await that anticipated date, register here and you’ll be among the first to receive priority information on progress, early purchase opportunities and access to the widest range of available homes.